Thunder Dragon Media: Roof of the World: Gerry Moffatt - Solitude and Tea on the Tsarap Chu from Thunder Dragon Media on Vimeo. Adventurer Gerry Moffatt spent much of the ’70s and ’80s guiding expeditions in the Himalayas. Now, on the cusp of turning 50, he’s back — in the midst of a 3,000-mile journey across India, Nepal, and Bhutan by motorcycle, foot, and kayak. His plan: to revisit the many rivers and roads he hasn’t seen in decades and to take stock of the changes that expeditions and other tourism has brought to the region in recent years. August 31. Rivers have an unforgiving way of quickly swallowing egos and ripping apart self-deception. I’ve lost count of the times I’ve sought to exchange fear and insecurity at the altar of the river gods in return for peace and serenity. Ignore your truth out there and the river can swallow you whole. These are the exchanges I’ve always needed and this is why I’m going solo. It’s not for everyone…and it may not suit me much longer either…but right now I’m searching for something that will strip me down to my roots and remind me of who I am. Moffatt on the Tsrap Chu River. 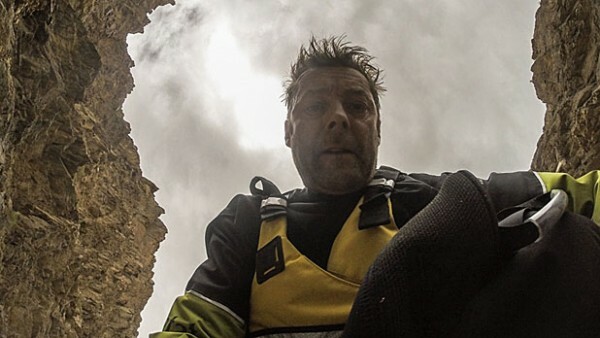 Moffat anticipated spending seven days on the river, but halfway through the trip, at the start of the Zanskar River, it began to rain — and it didn’t stop for five days. Moffat didn’t know it at the time, but he was running the river in the middle of the most extreme weather seen in over 50 years — monsoon rains would end up leaving Kashmir and large areas of Pakistan submerged. September 5. The unrelenting rain has transformed the river overnight into a dark gray, moving molten mass and putting in, I’m immediately swept up into the powerful current racing downriver. Dangerous, sporadic rock falls higher up in the mountains pepper the air with thunderous claps I can easily hear even over the river noise. The weather’s deteriorating fast and the cloud ceiling height is lowering quickly. . .Waves are big – breaking over my head, turbulent boils erupting from beneath, whirlpools and powerful eddies materializing and vanishing. This is the magnificent Grand Canyon of the Zanskar in her wrathful form. 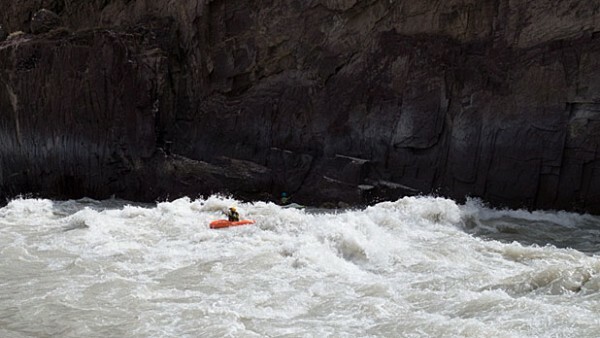 Moffatt quickly realized that when navigating rock falls and landslides from 100 feet above, the safest place was in the center of the river, and that the only way out was through. He paddled 11 hours straight to complete what’s normally a three-day kayaking expedition. Needless to say, he finished early. Once safely back in Leh, he waited out the natural disaster alongside the town’s residents, waiting more than a week for power and telephone service to return and the highways to reopen. At that point, Moffatt was ready to begin the first motorcycle leg of his journey, a 300-mile journey to Rishikesh, India via 17,500-foot TagLang La Pass. While he was initially concerned about snow (the pass gets snowed in every winter — blocking Leh off from the rest of civilization), road conditions turned out to be Moffatt’s biggest challenge. He described the precarious ride in his blog. September 19. So far, road conditions range from passable to horrendous. We go by several trucks and crews during the day in serious predicaments. I’m finding that riding a heavy, fully laden bike at altitude through these high mountain passes is tricky. A bit like kayaking class V whitewater actually. There’s a lot to negotiate…army convoys, big red TATA trucks with crazy drivers, hairpin turns with sheer drops into the abyss. You need to stay focused. On top of that, the Leh-Manali Highway itself is in a state of continuous deterioration from weather and tectonic upheavals. There’s really no point in having expectations out here — it’s one leg at a time. Next up: Moffatt arrives in Rishikesh, India, on the banks of the Ganges to explore how Westerners and “ashram tourism” have impacted the town. You can check back in, or follow Moffatt’s journey at gm-expeditions.com.